We’d love your help. 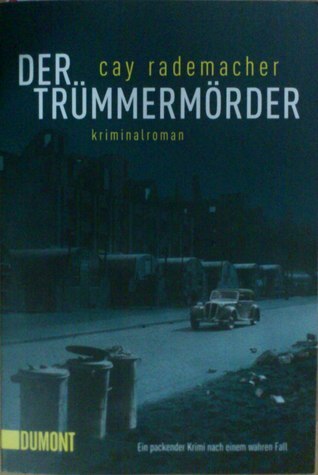 Let us know what’s wrong with this preview of Der Trümmermörder by Cay Rademacher. To ask other readers questions about Der Trümmermörder, please sign up. Over a relatively short period four bodies are discovered in the ruins of the devastated city Hamburg. All four had been murdered in a similar manner. What other links are there? Could they have been related? Chief Inspector Frank Stave is determined to find out who they were and who "dunnit". Like almost everyone in Hamburg in the aftermath of WWII, Stave has his own personal tragedies to deal with. In addition he has to solve the Rubble Murder case(s). He is assisted by his secretary Frau Berger, Inspector Maschke and the British Lieutenant MacDonald. However, can he trust his colleagues? Can he trust Dr Ehrlich the prosecutor who seems to be "a man with a mission"? Can he in fact trust anybody? The city (what's left of it) faces problems of starvation and general collapse. Does anyone even care that these murders have been committed? "Our society is a wasteland, the chief inspector thinks to himself. We detectives are just clearing up the rubble." "There really was a ‘rubble murderer’ who claimed four victims in Hamburg in the terrible, cold winter of 1946–7. That was the name he was given at the time, a name that struck fear in people’s minds. But who he really was remains a mystery. This thriller is based on the original case. A fairly solid murder/mystery set in Hamburg after the war. This is primarily a police procedural. The main character Frank Stave struggles with the loss of his immediate family and the need to survive each day in a city that is without the basic necessities and where the Black Market flourishes. The mystery component of the story was well presented but it was the descriptions of life in Hamburg, with the Occupying Forces that was fascinating. A very bleak existence for those who survived the war A fairly solid murder/mystery set in Hamburg after the war. This is primarily a police procedural. The main character Frank Stave struggles with the loss of his immediate family and the need to survive each day in a city that is without the basic necessities and where the Black Market flourishes. The mystery component of the story was well presented but it was the descriptions of life in Hamburg, with the Occupying Forces that was fascinating. A very bleak existence for those who survived the war and the effort to rebuild a city and society on the verge of collapse. An interesting story and perfectly described life in post-war Hamburg. Comment vous parler de ce roman tellement bouleversant ? Une époque bien trouble, une série de meurtres avec des victimes qu'on n'arrive pas à identifier mais surtout un roman basé sur une histoire vraie. Un roman policier certes mais surtout une petite fenêtre sur cette période très difficile de l'après guerre à Hambourg. Entre un hiver des plus coriaces, une population à la dérive après la fin de la 2ème guerre mondiale et un tueur en série introuvable, l'inspecteur Frank Stave se retrouve deva Comment vous parler de ce roman tellement bouleversant ? Une époque bien trouble, une série de meurtres avec des victimes qu'on n'arrive pas à identifier mais surtout un roman basé sur une histoire vraie. Un roman policier certes mais surtout une petite fenêtre sur cette période très difficile de l'après guerre à Hambourg. Entre un hiver des plus coriaces, une population à la dérive après la fin de la 2ème guerre mondiale et un tueur en série introuvable, l'inspecteur Frank Stave se retrouve devant une enquête pratiquement impossible à résoudre. L'assassin des ruines est un roman policier atmosphérique alors si vous êtes à la recherche d'un roman d'action passez votre chemin. Beaucoup de descriptions, une atmosphère sombre, déprimante et oppressive, on ne peut s'empêcher de se retrouver happés par toute cette douleur, tout ce désespoir qui transparaissent à travers les mots de l'auteur. On sent que ce dernier a fait des recherches très poussées sur l'affaire sur laquelle se base le livre et on sent clairement l'authenticité derrière ce récit vraiment émouvant ! An evocative police procedural set in the bleak post-war years of Hamburg. Although the translation is a little uneven at times (it's a little heavy on the Americanisms, despite the central characters all being German or British), it does a fantastic job in creating a vivid sense of place and time. The Murderer In Ruins, by Cay Rademacher (translated by Peter Millar), is a fictionalised account of a series of murders that were perpetrated in Hamburg during the freezing winter of 1946/47. Following the devastation wreaked by the Second World War large swathes of the city were reduced to rubble. Utilities and infrastructure were on the brink of collapse and the cold, hungry residents struggled to survive on subsistence rations. Within this bleak landscape a murderer is at large who strangles The Murderer In Ruins, by Cay Rademacher (translated by Peter Millar), is a fictionalised account of a series of murders that were perpetrated in Hamburg during the freezing winter of 1946/47. Following the devastation wreaked by the Second World War large swathes of the city were reduced to rubble. Utilities and infrastructure were on the brink of collapse and the cold, hungry residents struggled to survive on subsistence rations. Within this bleak landscape a murderer is at large who strangles and strips his victims, leaving their naked bodies in the ruins of the bombed out city. Nobody knows who these people are or why they were selected. The frozen corpses yield few clues. Frank Stave, is the police officer assigned to investigate the murders. He is required to work with two assistants: Lothar Maschke from the vice squad, who volunteered to join the team; and James MacDonald, a lieutenant in the British army, who was seconded by the Allied Administration as liaison officer. With memories of their active roles in the recent conflict still so raw it is difficult for Frank to know who he can trust to investigate these current crimes within the fair remit of the law. The prose is precise and, in many ways, as cold as the landscape in which the story is set, yet the humanity behind Frank’s thorough investigations burns through. This is a man struggling with personal tragedy in a city where every survivor harbours torrid memories. The vivid portrayal of the horror that comes after the devastation of war is uncompromising. Frank is offered every assistance by his superiors but the challenging conditions and few clues leave him little to work with. What he does uncover is a hidden war crime, a national secret, and a moral dilemma. Sides must be chosen where the nebulous concepts of right and wrong have become blurred. Brought to life within these pages are ordinary Germans. I couldn’t help but consider the parallels between the reasons why Hitler came to power and current attitudes in this country towards those who the media portrays as a threat to the comforts of the British people. If only we could resist the urge to follow self-indulgent leaders and learn from history. The denouement tidies up the many threads unraveled by this tale. The thaw in the weather feels as much of a relief to the reader as the conclusion of Frank’s varied investigations. A fine work of crime fiction that is unusual in its detailed, historic setting and Germanic tones. Well worth reading for the telling of the tale, and provides plenty on which to reflect. During World War II, the northern port city of Hamburg was nearly destroyed by bombing and the horrific bombing-induced firestorm of 1943 that killed tens of thousands. After the war ended, it was tremendously difficult to rebuild and supply the city. That process had barely begun in the winter of 1946/47, which was brutally cold. That winter, there was an infamous serial murderer at work in Hamburg, and his identity has never been found. Those murders were called the rubble murders, because the During World War II, the northern port city of Hamburg was nearly destroyed by bombing and the horrific bombing-induced firestorm of 1943 that killed tens of thousands. After the war ended, it was tremendously difficult to rebuild and supply the city. That process had barely begun in the winter of 1946/47, which was brutally cold. That winter, there was an infamous serial murderer at work in Hamburg, and his identity has never been found. Those murders were called the rubble murders, because the victims’ bodies were left in the rubble of the destroyed buildings. This novel fictionalizes that Hamburg winter, those murders and the police investigation. The British occupation authorities reconstituted the Hamburg police by cleaning out Nazis as best they could, resulting in Social Democrat Frank Stave being a Chief Inspector as this novel begins. Stave lives alone in a freezing apartment, next door to the bombed building where he lives with his wife and son. His wife was killed in a bombing raid and his son, a Wehrmacht soldier, has not returned from the Eastern Front. Rademacher expertly blends the story of the challenging investigation—taking place against the backdrop of the brutal winter, the near-starving population living in half-destroyed buildings, Nissen huts and bunkers, a black market where a once-valuable artwork may fetch a bit of butter—and the personal stories of Stave and his family, and of his secretary, a British officer who joins the investigation, and a witness who was once wealthy and is now scrabbling to survive. Rademacher’s style is hard-edged, but his Frank Stave is a sympathetic character whose experiences haven’t completely wiped out all belief in humanity. Bon, sans plus. Faut dire que je ne suis pas en partant une fanatique des polars... et je ne suis pas certaine que la traduction était à la hauteur. Mais le setting - l'Allemagne ravagée d'après-guère - était intéressant. Je lirai peut-être le prochain livre de la série. Im Winter 1946/47 wird Oberinspektor Frank Stabe von der Hamburger Polizei beauftragt, einen Mord aufzuklären. Es wurde eine Leiche in einem Trümmerfeld der ausgebombten Stadt entdeckt. Im Laufe der Ermittlungen, an denen sich ein Kollege von der Sittenpolizei und ein Angehöriger der britischen Besatzungsarmee beteiligen, stößt Stabe immer wieder an Grenzen, die den Fall unlösbar erscheinen lassen. Viele Möglichkeiten und Verdächtigungen, nichts konkretes. Genauso sollten meine Meinung nach Krimis sein. Dem Autor gelingt es, sowohl die Arbeit der Polizei, als auch die in diesem Fall sehr schwierigen äußeren Umstände, authentisch darzustellen. Die Hauptpersonen, insbesondere Stabe, sind glaubhaft gezeichnet, kämpfen mit inneren Widersprüchen und privaten Sorgen. Die Nebendarsteller von der Sekretärin über den Staatsanwalt bis zur vertriebenen Adeligen sind ausnahmslos gut und wichtig für die Handlung. Actionszenen á la Hollywood sucht man indes in diesem Buch vergeblich, was ich persönlich sehr zu schätzen weiß. Die psychologischen, sozialen und hier auch klimatischen Probleme stehen im Vordergrund. Auch die Sprache ich durchaus gelungen. An passenden Stellen werden Dinge lediglich beim Namen genannt, und auf Verben verzichtet. Die Dinge an sich handeln ja auch nicht. Lediglich die Fragen, die sich Stabe im Geiste immer wieder stellt, erscheinen mir etwas zu viel. Krimifans kann ich das Buch nur empfehlen, und auch Lesern, die an der unmittelbaren Nachkriegszeit in Deutschland interessiert sind. Allerdings würde ich es nicht unbedingt als Historienroman bezeichnen. Wer das Buch lesen will, sollte vorher nicht, wie ich, den Fehler machen, und den Klappentext zu dem Folgeroman "Der Schieber" zu lesen. Allein dadurch wird nämlich schon ein Handlungsfaden bzw. ein Verdachtsmoment von dem "Trümmermörder" sozusagen zertrümmert. Im Nachwort erklärt der Autor, dass es den sogenannten "Trümmermörder" in Hamburg im Winter 1947 wirklich gegeben hat. Im Gegensatz zum Roman wurden die Morde allerdings nie aufgeklärt, und wohl auch keine Verbindung zu einem SS-Massaker in Frankreich hergestellt. This is the first book in the “Inspector Franck Stave” trilogy, a historical fiction/mystery set in Germany, 2 years after the end of the Second World War. At the time, refugees are flooding the britsh-occupied city of Hamburg, already full with a starving crowd, in the coldest winter in living memory, and on top of all that, there is a murderer on the loose who enjoys leaving cadavers in the ruins. The book is told from the perspective of Franck Stave, an inspector who tries to catch the killer This is the first book in the “Inspector Franck Stave” trilogy, a historical fiction/mystery set in Germany, 2 years after the end of the Second World War. The book is told from the perspective of Franck Stave, an inspector who tries to catch the killer while surviving the hardships of the after war. Roman policier qui se déroule dans le Hambourg de l’après guerre en hiver 1947. Ambiance sordide, sombre et froide. On frissonne presque en le lisant. J’y ai découvert une autre facette de la guerre et de ses dommages collatéraux. La vie y était tellement dure, les gens crevaient de faim et de froid. Le roman est basé sur une histoire vraie, plusieurs crimes commis à Hambourg, mais dont le coupable n’a jamais été attrapé, alors que dans le livre, le policier en trouve l’auteur. A very good read as the author did a lot of research about the conditions of Hamburg after the war ended. Based on a real, unsolved mystery, this fictional story does a good job with a reasonable conclusion. I did find that sometimes the translations might have been too literal, and I lost the meaning. Still looking forward to the next book. 3.5 stars for this detective novel, set in post-WWII Hamburg. Great, gritty description of living in a bombed-out city with harsh conditions and shortages of everything imaginable--and during the coldest winter in decades. The "mystery" was pretty good as were the characters. Interesting story set in post WWII Hamburg, I look froward to reading more in the series. Hamburg nach dem Zweiten Weltkrieg, es ist der Hungerwinter 1946/4. Eine tote Frau wird in den Trümmern gefunden, nackt, mit Strangulationsspuren. Polizei-Oberinspektor Frank Stave, er wird während der Ermittlungen 43 Jahre alt werden, wird mit der Aufklärung betraut. „Die Briten haben nach dem Einmarsch im Mai 1945 Hunderte Polizisten entlassen – jeden, der bei der Gestapo war, der hohe Funktionen hatte, der irgendwie politisch aufgefallen war. Leute wie Stave, die im alten Regime als „links“ galten und die man auf unbedeutenden Posten kaltgestellt hatte, sind geblieben.“ S. 11 Ihm zur Seite gestellt werden ein Kollege von der Sitte, Polizeiinspektor Lothar Maschke - schließlich war die Frau unbekleidet, sowie der britische Verbindungsoffizier Lieutenant James C. MacDonald - Hamburg ist britisch besetzte Zone. Bald wird eine zweite Leiche gefunden, ein älterer Mann, auch er nackt, auch er stranguliert. Ein Serienmörder, ein Verrückter, ein mysteriöser Zusammenhang zwischen den immer noch namenlosen Opfern, zufällige Gemeinsamkeiten? Die Ermittlungen treten auf der Stelle, es gibt zunehmend Druck aus der Öffentlichkeit – regelmäßige Berichterstattung inklusive für Stave beim Leiter der Kripo, Carl „Cuddel“ Breuer https://de.wikipedia.org/wiki/Carl_Br... sowie beim Bürgermeister Max Brauer https://de.wikipedia.org/wiki/Max_Brauer, der klarmacht: „Ich aber werde nicht tatenlos zusehen, wie ein einziger verrückter Mörder eine Lage schafft, in der sich unsere Bürger nach den Nazis zurücksehnen.“ S. 222 Doch warum hat Stave das Gefühl, dass die Frau, Anna von Veckinhausen, die das zweite Opfer bei der Polizei gemeldet hat, etwas verschweigt? Er ist zunehmend fasziniert von seiner Zeugin und hat gleichzeitig Schuldgefühle, knapp 3 Jahre nach dem Tod seiner Frau und während er kein Lebenszeichen von seinem Sohn Karl hat, der sich mit 17 noch im April 1945 freiwillig gemeldet hatte. Dann wird der Ermittler wieder zu einem Tatort gerufen, ein Mann verschwindet und hinterlässt eine geheimnisvolle Botschaft und die Ermittlungsakten sind nirgends zu finden. Stromsperren, Bezugsmarken, Hamsterfahrten ins Umland, Schwarzmarkt, Nissenhütten, Ausgangssperre, Brennhexen – all das kommt im Roman vor und bleibt dennoch, von der Wohnsituation und der Brennhexe abgesehen, für mich seltsam blutleer. Die Wohnsituation schildert Autor Rademacher plastischer, mit der Ausbombung, dem Ersatz von defektem aus kaputten Häusern, den vereisten Scheiben, den fensterlosen Wohnungen in früheren Hochbunkern, den Nissenhütten aus dünnem Wellblech, in denen man mittig am Ofen stehend von vorne glüht und hinten eiskalt bleibt. Ähnlich beschreibt er die mühselige Nahrungszubereitung auf der Brennhexe, der Rest bleibt für mich – leider – Kulisse, einzig Staves Albträume sind mit-erlebbar. Der Autor hat, wie man seinem Nachwort entnehmen kann, recherchiert, selbst der „Trümmermörder“ beruht auf einem historischen, wenn auch nie aufgeklärten Vorbild. Der Vergleich mit dem erst im letzten Jahr veröffentlichten „Der Angstmann“ von Frank Goldammer drängt sich auf: Goldammer lässt den Leser den Krieg spüren, den Hunger, das Misstrauen, die Bombennacht, die Besatzung. Der historische Dresden-Krimi hat hier vielleicht den Vorteil, zeitlich einen größeren Zeitraum abzubilden – das ist es jedoch nicht. In Hamburg lese ich „..bis ihn draußen auf der Straße der Wind trifft wie eine eisige Faust.“ S. 274 oder „…trifft ihn der Wind wie ein Faustschlag.“ S. 99, das ist erstens eine Wiederholung über diese beiden Stellen hinaus und lässt mich zweitens den Wind nicht miterleben – Goldammer schafft das. Dafür ist bei Goldammer weniger nachvollziehbar, wie sich sein Max Heller in der NS-Zeit behaupten konnte, „seine Morde“ sind blutrünstiger. Ich kenne Dresden und Hamburg von sehr regelmäßigen Besuchen – beide Autoren nehmen in seltener Übereinkunft Abstand von Dialekt selbst bei Nebenfiguren. Da s-tolpert niemand über den s-pitzen S-tein, da gibt es kein „nu nu freiiilisch“, das ist verständlich (nachvollziehbar UND im Wortsinn), aber irgendwie schade. Straßennamen zählen beide auf – während Rademacher Gebäude beschreibt, fühle ich mich bei Goldammer in den Beschreibungen von Straßenzügen eher vor Ort (dafür sind es dann teils wieder zu viele Straßennamen). Ich mag Stave irgendwie lieber – doch sehe ich insgesamt nur 4 Sterne für einen durchschnittlich guten Krimi (gegenüber 5 für den Angstmann, den ich verschlungen hatte). Dennoch will ich dem zweiten Band eine Chance geben, weil mich das Thema der Nachkriegszeit dann doch ausreichend interessiert. Started this on January 24th, 2013, just after the last book I read. This was a free giveaway from Amazon at Kindle 12 days of XMas in Germany. Being German and born and living in Hamburg, I thought I would read this for a change, but of course it also has Nazis, though so far only on the sideline. Interesting to see my hometown described in rubbles after the war. The time is 1947, streets are often destroyed, a cold winter, people starving. And a killer, probable serial, leaves is victims naked Started this on January 24th, 2013, just after the last book I read. This was a free giveaway from Amazon at Kindle 12 days of XMas in Germany. Being German and born and living in Hamburg, I thought I would read this for a change, but of course it also has Nazis, though so far only on the sideline. Interesting to see my hometown described in rubbles after the war. The time is 1947, streets are often destroyed, a cold winter, people starving. And a killer, probable serial, leaves is victims naked lying in the open, though in places not too easily found. No CSI yet, and no DNA, not much to go on. For those who are born late after the war this book may be much more interesting as for those, who lived through the hard times. This is a book I will not recommend to my father. Good story and based on a true case. For that and the very authentic feeling 5 stars. Slightly reminiscent of Philip Kerr's Bernard Gunther series, but with more humanism and less black wit. A good mystery which, set in post-war Hamburg, will keep you in pursuit of the identities of the victims, as well as the murderer, along with Stave. team have to establish if the deaths are linked and if so, by what? I fell in love with Rademacher’s descriptions of postwar Germany. The book is set in Hamburg, right after the war, during the time of the British occupation, and in the winter. The aftermatch of the war and the lengths people must go to survive were fascinating. Like most, I’m not inclined to feel a shred of sympathy for a people who let the Holocaust happen under their noses, but Rademacher’s main character understands this and seems to suggest the deprivations faced were the consequences of th I fell in love with Rademacher’s descriptions of postwar Germany. The book is set in Hamburg, right after the war, during the time of the British occupation, and in the winter. The aftermatch of the war and the lengths people must go to survive were fascinating. Like most, I’m not inclined to feel a shred of sympathy for a people who let the Holocaust happen under their noses, but Rademacher’s main character understands this and seems to suggest the deprivations faced were the consequences of those actions. The story is a slow starter, but stuck with it and you will be rewarded with a highly competent crime novel set in the unusual setting of post war Hamburg. Hamburg in the immediate aftermath of the war is a grim struggle of survival in a bitterly cold winter, when the difference between life and death can be a successful forage for a lump of two of coal. With daily life at a unimaginable level of desperation, it is suddenly made even more bullish by a serial killer who appears to Excellent debut. Hamburg in the immediate aftermath of the war is a grim struggle of survival in a bitterly cold winter, when the difference between life and death can be a successful forage for a lump of two of coal. With daily life at a unimaginable level of desperation, it is suddenly made even more bullish by a serial killer who appears to be randomly selecting victims and leaving them naked and dead amongst the bombed out ruins. The man given the task to bring the murderer to justice is Inspector Stave, a man with his own demons to fight. Hamburg 1947; a humiliated city not yet recovered from British carpet bombing, now under British occupation, during a brutally cold winter. There is not enough food, not enough fuel; rationing is severe; many districts are simply rubble.The evocation of life in northern Germany at the time is superb - but I found the murder story rather laboriously developed. It would have been better as a non-mystery novel. I'd still be interested in reading the next volume, as this is the first of a trilogy. When I read the first few pages, was not sure if I would complete the book. Post war and very cold Hamburg. Liked the description of a very dogged inspector who gradually sorted out what was happening. The twists and turns at the end turned it into a very enjoyable read. If you enjoy crime fiction, I recommend this book. I must admit to been a bit cautious getting this book, however I am so glad I did get it. What a cracking read it has been, lovers of good old fashioned detective stories will love it as much as those who are in to historical fiction. Overall a great read and now looking forward to the next in this series. Seit einigen Jahren Redakteur bei GEO sowie Geschäftsführender Redakteur des Geschichtsmagazins GEO EPOCHE. Außerdem schreibt R. historische Romane und Sachbücher.